Strathmore University is seeking to rally the country towards use of renewable energy through a partnership to be signed Wednesday with German conglomerate GIZ. The partnership will see GIZ open a competence centre at the Strathmore Energy Research Centre (SERC) to serve Kenya, Uganda and Tanzania. The centre will offer clean energy training, policy discussions, quality certification and energy conservation practices to players in the energy sector. GIZ will provide technical expertise, networking and financial support to the tune of Sh44.4 million, while Strathmore, in addition to premises and accessories, has set aside Sh27.7 million for the programme. “The deal seeks to promote use of renewable energy in the region,” SERC project manager Geoffrey Ronoh said. The university will develop content for use by solar technicians in line with the energy (solar photovoltaic) regulations enacted by the Energy Regulatory Commission last year. The regulations provide a licensing framework for solar photovoltaic (PV) systems alongside facilitating proper use of clean energy to cut out sub-standard practices. The deal will also improve the regulatory framework to pave way for the integration of solar energy into the national grid. The three-year project is aimed at certifying the operations of more than 200 engineers in installation and maintenance of solar PV systems. 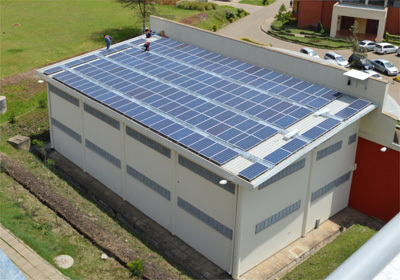 It follows plans by Strathmore to set up a one megawatt solar PV project valued at Sh222.2 million in order to cut its electricity costs. The university spends up to Sh25.8 million in power bills per year.